The United States government is concerned about India’s revised e-commerce regulations and has told officials in New Delhi that the policy will hinder the Indian investment plans of Amazon.com and Walmart Inc, three sources familiar with the talks told Reuters. 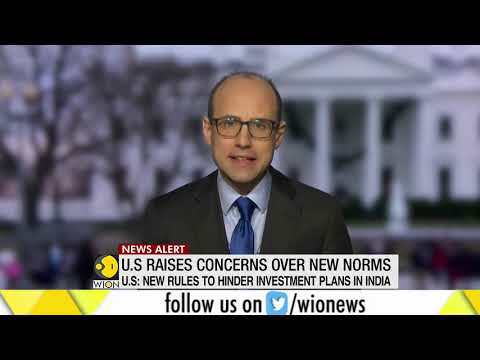 The tussle marks the latest in a number of US protests over Indian government policies which impact American companies and comes at a time when the two countries are trying to iron out other trade irritants. In 2017, the US lodged a written protest against India’s decision to cap medical device prices, which upset American companies. India’s e-commerce investment rules, which kick in from February 1, ban companies from selling products via firms in which they have an equity interest and also bar them from making deals with sellers to sell exclusively on their platforms. The policy has dealt a blow to Walmart, which just last year invested $16 billion in buying 77 percent of India’s Flipkart, and Amazon, as it would force them to change their business structures in the country and raise their operational costs. “There is a very strong undercurrent as to how this should be made a bilateral issue,” said a Washington-based industry source aware of the companies’ thinking. “This has gone way beyond being a local (India tussle,” the source added. A US government official earlier this month told Indian officials to protect Walmart and Flipkart’s investments in the country, an Indian trade ministry official told Reuters. The US government cited “good relations” between the two countries and stressed that American companies should be given concessions in the larger interest of bilateral trade, but India gave a “non-committal” response, the source added. But Indian Prime Minister Narendra Modi is unlikely to delay the revised rules or amend them in any meaningful way as he is seeking the support of the tens of millions of small retailers and traders in India ahead of a general election that must be held by May. The small firms see Walmart and Amazon as a threat to their businesses. An Indian industry source said Walmart, Amazon and lobbying groups were coordinating efforts with the Office of the United States Trade Representative (USTR and the local embassy to express their discontent about the policy. The USTR did not respond to a request for comment. The US Embassy in New Delhi, and Indian trade ministry spokeswoman Monideepa Mukherjee declined to comment. Asked about the Indian policy’s implications, Walmart spokesman Greg Hitt said: “We certainly, as you would expect, have engaged the (United States administration on this issue.” He declined to share further details. Amazon India said it was committed to complying with local laws but it needed “adequate time to understand” the policy. Amazon and Walmart have both made bold bets to tap India’s booming e-commerce market, which Morgan Stanley had estimated, before the latest government move would grow 30 per cent a year to $200 billion in the 10 years up to 2027. The companies have targeted a growing population of tech-savvy shoppers in India, luring them with deep discounts on everything from dishwashers to smartphones. India’s small traders and shopkeepers had for years complained that e-commerce companies were engaging in predatory pricing and hurting the businesses of brick-and-mortar retailers. They alleged that the online retailers used their control over inventory from their affiliates to create an unfair marketplace that allowed them to sell some products at lower prices.Such arrangements would be barred under the new policy. “We are disappointed more than surprised. It makes it harder to plan things,” a US-based Walmart source told Reuters. “It is a serious issue. We are doing our best to work with Indian authorities and trying to explain why this is bad for business,” the source further went on to say. The Confederation of All India Traders, which has supported tougher scrutiny of large e-commerce players, said the companies were acting “desperate” by pressurising the Indian government. “Any deferment or change (in the policy will adversely affect millions of small businesses,” said the group’s secretary general, Praveen Khandelwal. Both Walmart-owned Flipkart and Amazon have requested the government to delay implementation of the policy, but India is unlikely to relent. Indian officials have told Reuters no relief was likely as the policy was seen helping the small trader community, who form a critical voter base for Modi. “The idea is just to win over the trading community ahead of elections and on that point, the government will not budge from the deadline,” a second Indian trade ministry official said. At stake are big-ticket investments. When Walmart bought Flipkart last year, it said the decision underscored its “long-term commitment to India”. Amazon has committed to investing $5.5 billion in the country and Modi has in recent years met its founder Jeff Bezos multiple times. In 2017, Bezos said he was “excited to keep investing and growing” in the country. That investment climate has turned sour with sudden policy changes. Prasanto Roy, a New Delhi-based consultant who closely tracks India’s technology policy landscape, said the government should provide stable policies to attract investment. “You can’t change policies overnight without consultation and tell companies who have invested billions to go fly a kite,” Roy said. PM Theresa May’s Brexit deal is dead. What now for Britain?